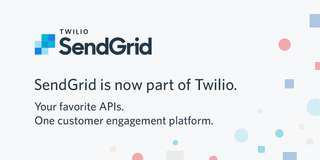 Twilio (NYSE:TWLO), the leading cloud communications platform, today announced the successful completion of its previously announced acquisition of SendGrid, Inc., the leading email API platform. This follows approval by the stockholders of both companies at separate meetings on Jan. 30, 2019. This transaction is valued at approximately $3 billion. Based on the closing price of Twilio Class A common stock on Jan. 31, 2019 and the exchange ratio of 0.485 shares of Twilio Class A common stock per share of SendGrid common stock, SendGrid stockholders received approximately $53.99 of aggregate value per share of SendGrid common stock. As a result of the acquisition, shares of common stock of SendGrid ceased trading prior to the open of the market on Feb. 1, 2019 and will no longer be listed on the New York Stock Exchange. The ability to deliver consistent and personalized messaging based on the customers’ preferred form of communication. “As a customer of both Twilio and SendGrid, we couldn’t be more excited for two of the leading customer communication platforms in the market to come together,” said Matthew Daimler, VP of Strategic Initiatives at Zillow Group. “Purchasing a home is one of the most important decisions that a person will make in their lifetime therefore, our customers expect to communicate with our realtors in a timely and personalized manner whether it be via phone, text or email. Having one seamless customer communication platform that offers omnichannel engagement transforms the way we interact with our customers." With SendGrid, developers and businesses can use Twilio to reach their customers over any channel - voice, SMS, Facebook Messenger, WhatsApp, video, and now email. Across a wide variety of customer touchpoints, companies can now trust one platform to deliver the right communication, on the right channel, without having to setup different vendors for each approach. This press release contains forward-looking statements within the meaning of the federal securities laws, which statements involve substantial risks and uncertainties. The words such as “will,” “expected,” “could,” and similar phrases that denote future expectations or intent are intended to identify forward-looking statements. You should not rely upon forward-looking statements as predictions of future events. These statements are based on management's current expectations, assumptions, estimates and beliefs. While Twilio believes these expectations, assumptions, estimates and beliefs are reasonable, such forward-looking statements are only predictions, and are subject to a number of risks and uncertainties that could cause actual results to differ materially from those described in the forward-looking statements. The following factors, among others, could cause actual results to differ materially from those described in the forward-looking statements: adverse changes in general economic or market conditions; changes in the market for communications; Twilio’s ability to adapt its products to meet evolving market and customer demands and rapid technological change; Twilio’s ability to generate sufficient revenues to achieve or sustain profitability; Twilio’s ability to retain customers and attract new customers; Twilio’s limited operating history, which makes it difficult to evaluate its prospects and future operating results; Twilio’s ability to effectively manage its growth; Twilio’s ability to compete effectively in an intensely competitive market, and risks that the anticipated benefits of the acquisition of SendGrid may not be fully realized or may take longer to realize than expected. The forward-looking statements contained in this press release are also subject to additional risks, uncertainties, and factors, including those more fully described in Twilio’s most recent filings with the Securities and Exchange Commission. Further information on potential risks that could affect actual results will be included in the subsequent periodic and current reports and other filings that Twilio makes with the Securities and Exchange Commission from time to time. Forward-looking statements speak only as of the date such statements are made. Except as required by law, Twilio undertakes no obligation to update or revise these forward-looking statements for any reason, even if new information becomes available in the future.